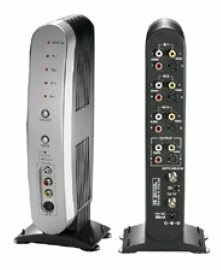 For people with an older TV which only has a RF antenna input jack, you can still use a DVD player, TIVO DVR and more. Just hookup all your input devices to an audio/video switchbox and output to your older TV thru the RF coaxial cable. Switchboxes are available for around $25 (Wal-Mart model PH61153) with built-in RF modulators which allow all your input devices to plug in and send out to your TV set on channel 3 or channel 4. Your cable TV signal comes into your cable tuner box, is decoded and will pass thru the switchbox and go out to your TV. When you want to watch a DVD Video, power on the DVD player and the switchbox will automatically detect the signal, convert to RF on channel 3 or 4 and send to your TV. Your TIVO DVR gets input from the decoded cable box signal and records to disk. Playback is just like the DVD player. Audio/Video switcher for older RF only TV sets or TV sets with RCA input jacks. The TV connects to the RF output where it gets the converted signals. Plug in all your input devices using RCA phono cables, select channel 3 with the small switch on the switcher box and set your TV to channel 3. Power on input device, switch box and TV. Play input device and view on TV. Normal TV viewing on channel 3. Change cable TV channels on your cable TV tuner box with its remote control. Leave TV on channel 3. For output to a TV with RCA input jacks, plug in RCA phono cables to the RCA composite outputs on the switcher box and then select the proper LINE input on your TV using your TV remote control. You could also use a VCR or DVD recorder as your output.